Bearish AB=CD is a simple but widely found harmonic chart pattern drawn following some simple steps explained in this post. 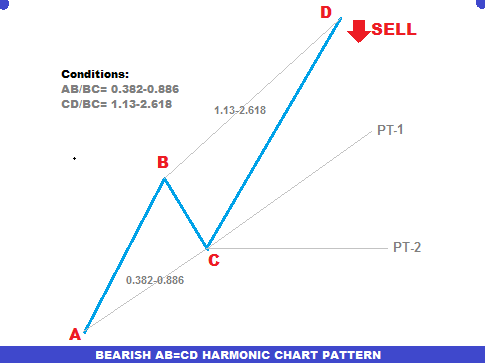 Bearish AB=CD harmonic chart pattern suggests a short entry upon completion of the pattern. 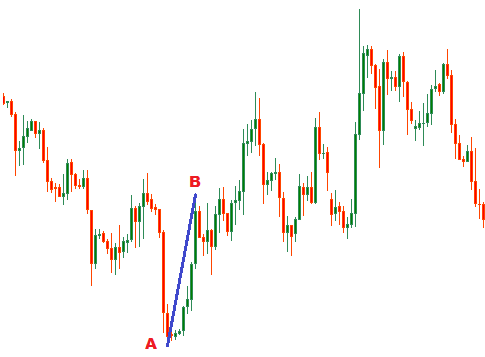 To trade the pattern, firstly traders need to find the pattern on the price chart. 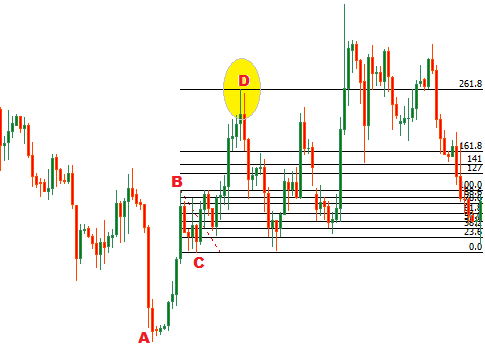 How to find a bearish AB=CD harmonic chart pattern on price chart? The fist step to find a Bearish AB=CD harmonic chart pattern is to find A and B points of the pattern. The A and B points are found at the bottom and top of a bullish trend respectively. In the next step, we will find the C point of the bearish harmonic chart pattern. 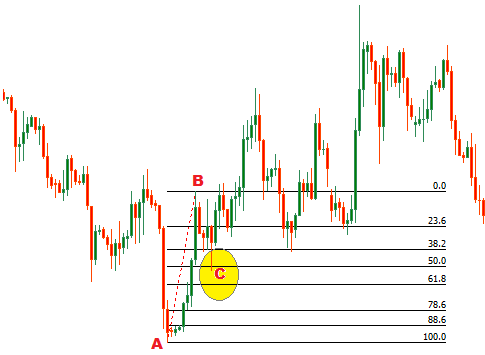 To find the B point, we will draw a fibonacci retracement tool from A to B. The B point should be at the 38.2-88.6% fibonacci retracement level of AB. Look at the following illustration. In this step, we will draw a fibonacci retracement tool from B to C to confirm the D point of the bearish AB=CD harmonic chart pattern. The D point should be at the 113-261.8% fibonacci retracement level of BC. How to trade the bearish AB=CD harmonic chart pattern? When the D point of the bearish AB=CD harmonic chart pattern is confirmed, a short entry is suggested. The stop loss for the order at point D should be placed above the upper fibonacci retracement level or other resistance level. The profit target for the above order should be placed at the AC trend line. In some cases, AC trend line can be broken by the price then the profit target can be placed at the 50-88.6% fibonacci retracement level of CD. Following image explains such a situation. 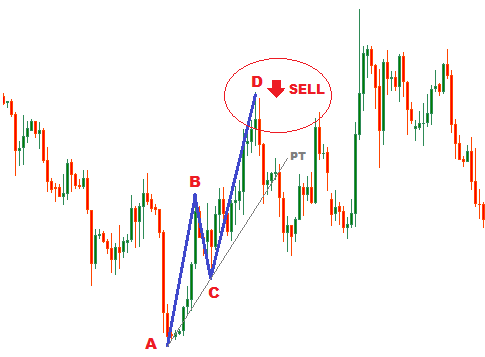 This post explains the basics to trade bearish AB=CD harmonic chart pattern. If you want to join the discussion with other traders, you can drop a comment bellow. You can also subscribe yourFXguide to receive updates. When should we considered D point confirmed as it is a range from 113 to 261%? Thank you for your nice question. I hope I will edit my post later to answer this question. Okay, we know it is a range but still we can predict the D point. If BC is relatively large, you can expect that the D would be at the 113%. But if the BC is relatively small the D may be at the 261% retracement of BC.In another way, if the C is at the 38.2% fibonacci retracement of AB, the D can be at the 2.618% fibonacci retracement of BC. And, if C is at the 88.6% fibonacci retracement of AB, the D can be at the 113% fibonacci retracement of BC. usually indicates which BC projection is utilized to define the Potential Reversal Zone (PRZ). the completion of the AB=CD."